FAQ Home | How do I share a creation? Sometimes you'll find a creation on COLOURlovers that's so good, you just have to share it with the world. Luckily, we've made it easy to share anything you find on the site. 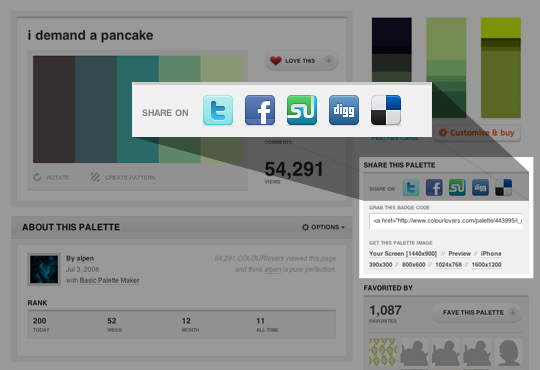 To share a great creation, browse to a color, palette, pattern, etc that you want to share, and click on one of the "Share On" icons in the right-side column to share on Twitter, Facebook, or other social network. You can also grab HTML code that you can use to display a badge for the creation in a comment on COLOURlovers, on your own website, or anywhere else on the web. Or, download the creation as an image to set it as your background wallpaper or use it in a creation of your own. Not what you were looking for? Try searching our FAQ.